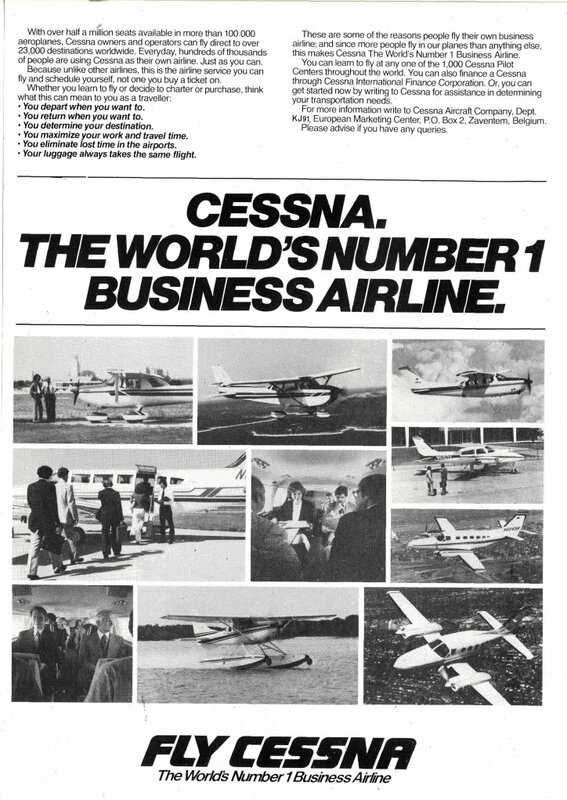 In the late seventies, Cessna launched a campaign targeting business travelers. The airplane manufacturer anointed itself “the world’s number 1 business airline” — with a fleet of 100,000 planes that could land at any of 29,000 destinations worldwide. You too can avoid the hassle of modern airline travel! All you have to do is buy your own airplane, learn how to pilot it, find a place to keep it, learn how to maintain it, fill it with gas, check the weather reports, and file your own flight plans. What could be simpler? Like car manufacturers, Cessna depends on a network of dealers to sell its airplanes. Depending on dealers means being at their mercy. If they’re happy, they’ll sell more planes. If they’re not happy, you’re in trouble. 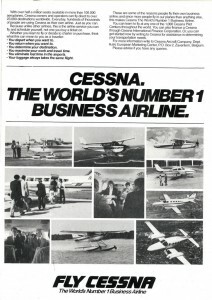 So from November 13 to 14, 1980, Cessna brought their dealers together at company headquarters for a two-day bash in Wichita, Kansas. (Remember: what happens in Wichita, stays in Wichita.) The event was called Expo ’80, and everything I know about it, I learned from the pictures on the cover of its souvenir album. Expo ’80 featured an enormous exhibition space, decorated like an airport with a fake control tower and everything. Visitors wandered around examining Cessna’s aircraft and booths explaining Cessna’s advertising strategy and ways dealers can boost profits. It also featured an all-singing, all-dancing revue: Fly Cessna. An industrial musical. Industrial musicals used to be a common way to rouse the team spirit of employees and sales staff. Even by 1980, industrial musicals were on the way out. Nowadays, companies produce lavish corporate videos to inspire the troops. But in the middle of the 20th century, they commissioned actual musicals, often from Broadway composers and lyricists. These musicals had songs, they had characters, they had a plot. Just about the only ways they differed from Broadway are, first, they usually weren’t that great, and second, they were all about a company. They were big business, too: one composer recalls that the 1957 Chevrolet Extravaganza had a budget, $3 million, that was six times the budget of My Fair Lady, which opened on Broadway the same year. That kind of money often attracted serious talent. The companies that employed that talent ran the gamut of the Fortune 500. General Electric staged “Go Fly a Kite,” in which GE uses its electrical equipment to literally turn Hell into Heaven. Coca-Cola staged “The Grip of Leadership,” a paean to brown fizzy sugar water as the very embodiment of the American Century. Exxon staged “The Spirit of Achievement,” the Broadway musical Ayn Rand wishes she had written. It was Stone who wrote the music for Fly Cessna; David Blomquist wrote the lyrics. Fly Cessna didn’t reach quite so high as some of the more notorious industrial musicals, but that’s a good thing: it means it doesn’t sound quite so ridiculous today. Don’t worry, though: it still sounds pretty ridiculous. On the album, the title song (above) is followed by “One of a Kind,” a song that is, ironically, actually pretty generic. Having helped its dealers understand their customers, Cessna now tries to prove that it understands its dealers. The flip side of the record starts with “More,” an acknowledgement of how much harder it is to sell airplanes than it used to be. The next song, “Growing Pains,” is a curious mixture of apology and apologia from Cessna: sure, the company screws a lot of things up, but that’s just what you’d expect from a growing company and besides it’s all over now. That’s the song that brought the dealers to their feet. At least, it certainly sounds like it from the applause they added to the studio recording. And that’s why, on November 15, 1980, 800 Cessna dealers left Wichita determined to sell more planes. Agency: The Kerbawy Company, Detroit, Mich.
We’re revving up to run. With business, how we’ll shine! The world’s number one business airline! The tune is new this year. have got to impress ya. nobody but nobody beats Cessna! In business, how we’ll shine. I was explaining to my grandson about the Cessna expos recently, and as I was cleaning out some records, I came across the Fly Cessna album. I was in the marketing department then, and the next year, we took an around the world-marketing trip, in a last ditch effort to move some aircraft. Great times, not for the industry, but for the creative types trying to sell product.